My first visit in Siargao was a grand experience to remember. 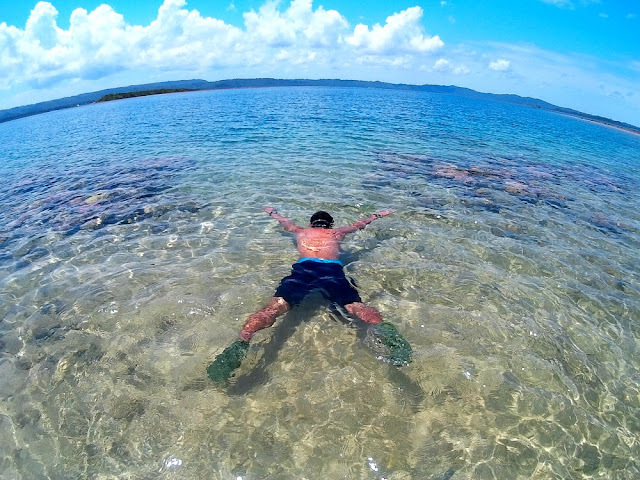 Given that I am just a six hour bus ride away from Surigao City, I never had a chance to visit the famous island until a collaborative plan with a friend Mervin or Pinoy Adventurista was placed into reality. I was anxious to go there but good thing we met some local residence and active surfers Janice and Kyong that gave us an idea on things we could expect from the island. For the mean time, we scouted the small city of Surigao also known as the gateway to the islands of Visayas due to its proximity coming from Northern Mindanao. We look into various pasalubong shops, restaurants and stop over for a coffee break at Island Restaurant adjacent to city’s grandstand. After an hour of wandering, we went to my favorite part of the city- the foot reflexology at the heart of the park. The local reflexologists in the heart of the city plaza are known to be the devotee of the now installed second Filipino Saint Pedro Calungsod. 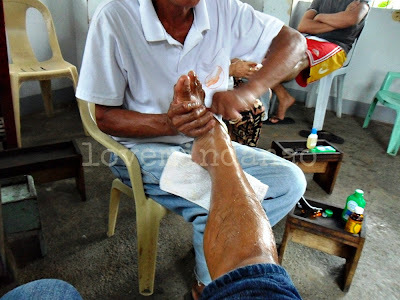 For first timer to experience foot reflex, the pain is really excruciating and unbearable. But after the 30 minute session, the pain will be replaced with a full relief as if you were rejuvenated from a very stressful day. There is no fix amount for the service, you just have to donate any amount you feel that fits the service provided by the reflexologist. At night, we had a gut fulfilling dinner in one of the best barbeque houses in the City- Same Place Grill House together with Surigao based fellow blogger Nathalie of My Wandering Soles. Coincidently, it was also Mervin's Birthday so we went to Alcatraz Bar to celebrate together with a few friends of Nathalie where we met also another fellow blogger Jeffrey Rilles. After a couple of beers , we decided to retire in one of the affordable “okay” hotel near the port-Aden Hotel for only Php680.00 good for two occupants. We woke up at 4:00am and went to BritPhil Ferry scheduled first trip bound for Siargao. The fare was Php 250.00. Together with new found friends Janice and Kyong, we arrived in Dapa port at 8:00am. We took a habal habal for Php 300.00 to transport us to Gen. Luna and checked in at Ocean Pacific Inn for Php 500.00 a night. The inn was only 50 meters away from the boardwalk leading to the surfing area. The surfing sites in Siargao are at the front of boardwalk approximately 100 meters from the shore. The waves are of different characters with names like Jack Horse, Quick Silver and the famous Cloud 9. The 15 foot-giant wave of Siargao in Brgy Gen. Luna appears at the start of the ‘ber’ months but you can still enjoy surfing all year round. As a newbie in surfing, I requested for an instructor to teach me the means and ways of surfing. It was a trial and error at first but I got lucky on my second attempt. I felt the rush of adrenalin as I kept my balance standing on top of the surf board over the raging waves. According to my instructor I did an amazing job for a beginner. That comment inspired me to try more, and more and more, and this time the nervousness was completely gone and what has remained was the addiction of multiple attempts of successful surf. Though I have fell on most of my attempts the joy and lesson from the activity was incomparable. At dinner, we enjoyed our delicious prepared crabs. It was so tasty that even a smallest fiber of it did not escape my taste bud. Tired and delighted with our food we slept early while s summer rain poured down so heavily. Chilling. We left the Inn the next morning and tried to catch the first ferry bound for Surigao City. Along the way, one of the wheels of the habal habal we were riding on have gone flat, then followed by heavy rain .What a series of unfortunate event that was. We hurried walking towards the direction of the port. Luckily a pickup truck passed by and we requested the driver (a foreigner) if we could hitch going to the port. He never hesitated saying YES. We made it to the port, soaking wet together with dozens of passengers that have not anticipated the heavy rain . It may look like a series of unfortunate events but the true essence of adventures was there. The ferry left at 5:00am and arrived in Surigao City at 7:00am. hahaha nakakarelate naman ako sa post na to Dennis:) I've also experienced that reflex in Luneta Park of Surigao jejeje masakit pero sarap! huhuhu my fave crabs- sarap db? Why does it take 8 hours to travel from Surigao del Sur to Surigao City? Is it really far? I've always wanted to go to Siargao and try surfing there but I've had hesitations knowing that the waves in Siargao are really big. I might not be able to manage. But you inspired me. I'm fine with the P500 instructor's fee and board rental. But my gosh, I was surprised at the P300 habal-habal fare. Is there any other way to get there aside from habal-habal? I had a motorcycle accident which makes me really nervous to ride HH. And I think P300 is too much... Any alternative? At least, you were able to try surfing. It's one of the activities I have yet to try. It's good that you were also able to hitch a ride to the ferry. given the opportunity I would like to try surfing. it seems like a very fun sport/hobby though little pricey. hehe.. You sure had an adventure there. I read a lot of nice things about Siargao, surfers' haven! Your blog provides me another image of Mindanao which is very much different from the war-torn Mindanao that I see on the news. My most favorite pic of all - CRABBBBSSS! you can wait for the multicab at the public market but it will take hours. they have to wait for passengers until it is full ... and of course it is inconvinient... the 300 is shared with your companions... the travel will last for 30 minutes which is quite a distance going to GL. This is the experience I wanted for a long time. A surfer's paradise indeed. what a cool, relaxing and yummy experience you had... kakainggit... hehehe. hope i can also visit surigao someday to try their beaches and surfing in their waves. Yahweh bless. Surprisingly you were able to encapsulate this post into a short one.. I would have flip out If I were to cover many days in one post. 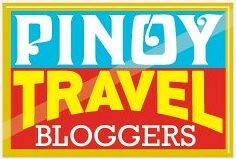 I've only met a few PTB on the road, I guess lucky you were with Pinoy Adventurista..
Would like to see more of your post! Love Mindanao! Nice adventure you have in Siargao and the CRABS are mouth-watering! I'm officially craving for those red delectable dish. Looks great! Reading this post has got me even more excited about my upcoming trip to Siargao. I hope I have the same luck as you when it comes to the surfing lessons. I wanna have an incredible adventure and experience like this. I heard great stories about Siargao. Surfing must be in your blood as you were able to get the hang of it immediately. I think Siargao Island is fast becoming one of the top destinations in PH.. Lots of nice places in the area, foods and just look at those waves! I have read about Siargao and saw photos of the place already I'm itching to go there as soon as I'm done with my other trips. 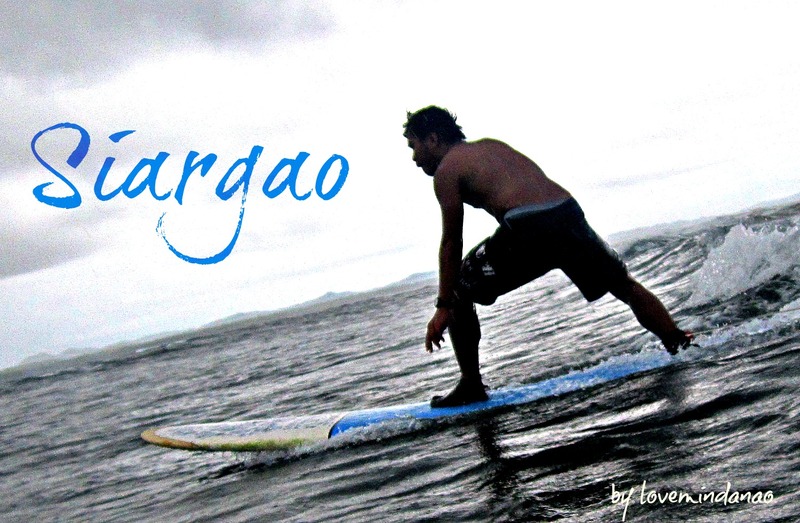 Aside from surfing, what else can you see or do in Siargao? That trip ain't that bad, given your series of unfortunate events. Siguro the weather was playing with you for doing well on the surf board as a newbie! Hehehe..
Away from the beach, are there Nature's Park where one can go.. Medyo di ko feel ang surfing. The place is haven of perfect creation, love what I am seeing! nice wave, every surfer would love to be in that sea. The crab is mouthwatering.